Do you feel that your Windows 7 machine boots faster? If that is so, we share the same sentiments. But since our computer system is newer and more robust, we feel that it is due to the upgrade(s) made. And in due time boot time will degrade due to several factors including but not limited to hard drive fragmentation. However, Windows 7 has built-in mechanisms and algorithms to make boot up faster -- by utilizing the available processors or cores. This is just one of the many ways to make Windows 7 boot faster. I'd say this is the easiest tweak to perform. Here's how..
Open the "Run.." diaglog window. Press [WIN] + [R] simultaneously. Doing so opens the "Run.." dialog window. Then type in "msconfig" (without quotes). You should see a similar window as below (see screenshot). Go to the "Boot" tab and select "Windows 7.." as seen above. 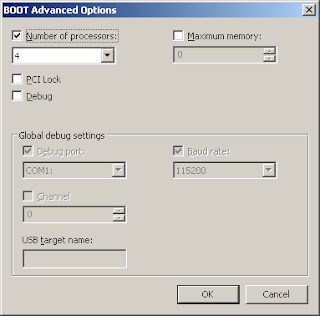 If you do not have a multi-boot system this is selected by default. Click on "Advanced options..." and another window will open (see below). Tick the check box next to "Number of processors:" then select the number of processors (or cores) that your system has. In my case, I got a Q9550 so I selected 4 (for 4 cores). This part is easy as Windows automagically identifies the maximum number of processors your system has. Just select the maximum number from the drop down list. Accept all changes.. Reboot if you wish so you can check the performance improvement.